As the first snows of December drift across my South St Louis windows, and the last shards of Thanksgiving turkey find their way into the requisite casseroles, cold cuts, and cauldrons of stock, I find myself harkening back to early Advent Sundays of yore. My childhood, like so many others, was loaded with the humor of the holidays, but one of my family’s favorite traditions always tended in a more marsupial direction. So if you’ie got some time between mixing tubs of “Tom and Jerry” and trimming the tree, I’d like to share one of many meaningful excursions through the absurd quadrants of kiddie Christmas culture. Happy Birthday, Julia A. Moore! Her most poetized topics were the joys of sobriety, the sudden deaths of small children, and fallen soldiers. Mark Twain is said to have counted her among his favorite poets because she made him laugh. Twain alluded to her work in Following the Equator, and is thought to have based the character of Emmeline Grangerford in Adventures of Huckleberry Finn on her as well. In addition to being maudlin, she was also prolific. Two of her poems are below. If you haven’t had enough, you can read more by clicking here. And he was drowned, I was told. While on earth they do remain. Yet he the danger did not see. When, alas, this child fell in. He was drowned and was gone. It almost made their hearts grow wild. From that little infant son. Be careful of your little ones. And his colors has unfurled. Your feet shall never stray. If you keep the shining way. For He’s ever on the right. And listen to my rhyme. And let be the cursed wine. Can be a sober man. With all your main and might. Will do you all no harm.
. . . Here’s to the next four years. Let’s laugh to keep from crying. I am pleased to announce the Humor in America book series at Penn State University Press. Although sharing a name and an editor, the series is not officially connected with this site, but it does share the same goals: the intelligent and illuminating scholarly discussion of humor. From Benjamin Franklin to Mark Twain, Mel Brooks to Richard Pryor, Our Gang to Inside Amy Schumer, American humor has time and again proven itself to be more than mere entertainment: it has brought cultural norms and practices in America into sharp relief and, sometimes, successfully changed them. The Humor in America series considers humor as an expression that reflects key concerns of people in specific times and places. The series engages the full range of the field, from literature, theater, and stand-up comedy to comics, radio, and other media in which humor addresses American experiences. With interdisciplinary research, historical and transnational approaches, and comparative scholarship that carefully examines contexts such as race, gender, class, sexuality, and region, books in the Humor in America series show how the artistic and cultural expression of humor both responds to and shapes American culture. The series will publish mainly authored volumes, not edited collections, and will appeal to audiences that include scholars, students, and the intellectually curious general reader. Judith Yaross Lee is Distinguished Professor of Communication Studies and Charles E. Zumkehr Professor of Rhetoric & Culture in the School of Communication Studies at Ohio University in Athens, Ohio, and the author, most recently, of Twain’s Brand: Humor in Contemporary American Culture. Tracy Wuster teaches at the University of Texas at Austin. He is the director of the Humor in American Project at UT and the executive director of the American Humor Studies Association. 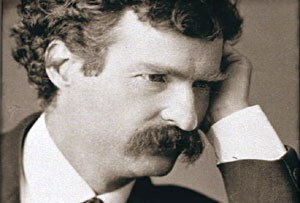 He is the author of Mark Twain, American Humorist. Initial inquiries should take the form of a three- to five-page proposal outlining the intent of the project, its scope and relation to other work on the topic, and the likely audience(s) for the book. Please also include a current CV. The editors note that although it is a logical fallacy to expect scholarship on humor to be funny, the best humor scholarship can be fun— and illuminate its exemplars’ comic spirit—while also being intellectually rigorous and a pleasure to read. Edwina Dumm was the first female to draw political cartoons regularly for a daily newspaper in America. She was born in 1893 in Ohio. Her father was an entertainer who got into the newspaper business. Edwina, fascinated by publishing and having a penchant for drawing, took a correspondence course in art and eventually landed a position with the Columbus Daily Monitor in Ohio. 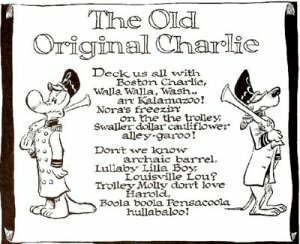 To be clear, Ms Dumm was not the first female to publish political cartoons in the United States, just the first one to publish cartoons on a daily basis for a newspaper. 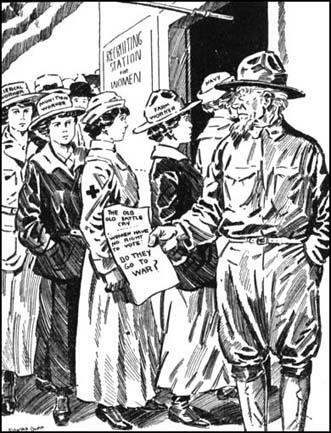 There are many examples of other women publishing political cartoons in journals, especially suffrage journals, before Dumm. The Columbus Daily Monitor only ran from July 10, 1916 to July 5, 1917, but Dumm’s contribution to the newspaper is its most enduring aspect. In the early 20th century, women did not get many opportunities to express themselves politically, and a neophyte newspaper would be the ideal place for a woman to exploit for that purpose. She was talented and motivated, and in the culture of separate spheres, demanded less money than the men. What more could a newspaper want? Shown below, “Lost Argument” is, perhaps Dumm’s best known cartoon. In it she suggests that women should be recruited for World War I and that they have many of the necessary skills. However, true to the chivalry of the times and from the look of the commanding officer reviewing the recruits, it ain’t gonna happen. 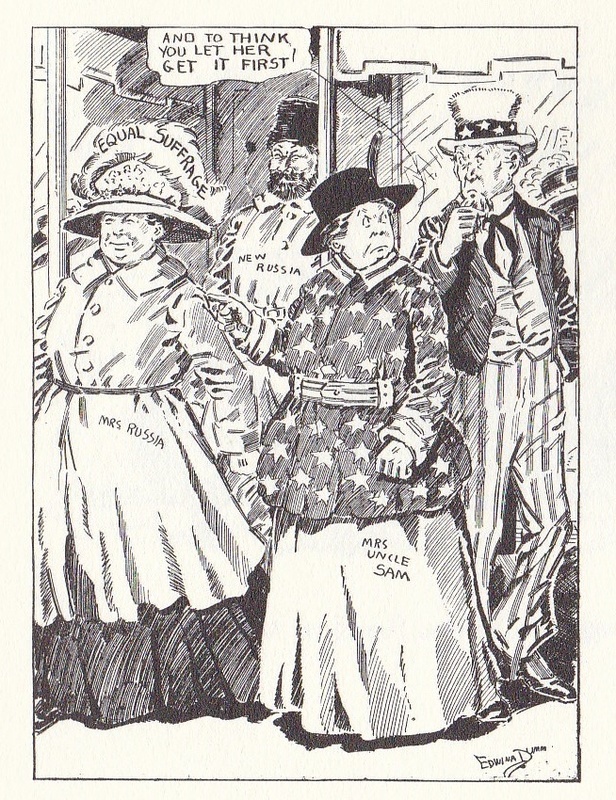 In her book, Cartooning for Suffrage, Alice Sheppard cites several examples of women’s rights and suffrage cartoons by Dumm, including the one above. However, the following Dumm cartoon shows how scathing her criticism of the American suffrage imbalance could be. When Russia gave women the right to vote in 1917, she suggests that if a politically unstable country can grant the vote to women, surely an established country like the United States can as well. Pulitzer Prize editorial cartoonist, Signe Wilkinson says of women political cartoonists in the early 20th century, “After the suffrage campaign succeeded, these cartoons vanished from the printed page, leaving rare, brittle clippings and the 19th Amendment as the only traces of their public lives.” And while that happened to most women cartoonists, Dumm’s career ended because the Daily Monitor went out of business two years before the passage of the Susan B. Anthony Amendment. Of political cartooning for a newspaper, Dumm said the only discrimination she experienced was that she was not invited to socialize with the other political cartoonists drawing for various newspapers in Columbus at the time. However, she did have to contend with at least one condescending tribute to her efforts. An article in a 1917 issue of the magazine Cartoons begins, “She is a ‘regular’ cartoonist and has her workshop in a real newspaper office amid the click of telegraph instruments and typewriters.” When the Monitor went belly-up, no other newspaper in Columbus would hire her; however, she was able to land on her feet. She moved to New York City and achieved her more notable cartooning legacy. She created a cartoon strip called “Capp Stubbs and Tippie” (shown below) that was syndicated nationally. She also worked on other comic strips and illustrated children’s books until she retired in 1966. 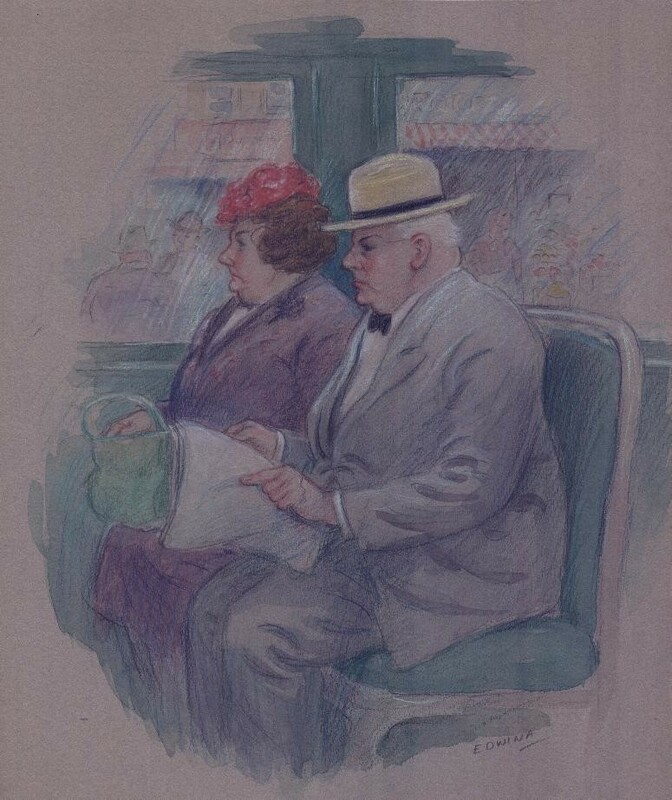 Her retirement included painting watercolors of people in the New York Subways (below). Chris Lamb, Drawn to Extremes: The Use and Abuse of Editorial Cartoons, New York: Columbia University Press, 2004. 92. PhD candidate in Cinema and Media Studies @USCCinema. Occasional/lapsed photographer, filmmaker, actor. This week, a conspiracy theory emerged in the fever swamps of the Internet, linking Hillary Clinton campaign manager John Podesta to a ring of pedophiles and child abusers. A satirical website titled RealTrueNews posted a story satirizing the ridiculousness of some of the arguments in this conspiracy theory. Within a day, this satirical take was picked up and reproduced in earnest, word for word, by several right-wing conspiracy theory websites. The satirical article is credited to a “Max Insider,” one of the four posters on the website. The others go by the names “Projekt Pyramid”, “#NeverEVERHillary”, and “Lex Icon”. If you are still unsure about the satirical intent from the names, you need only to take a look at their About page and recent articles for proof. 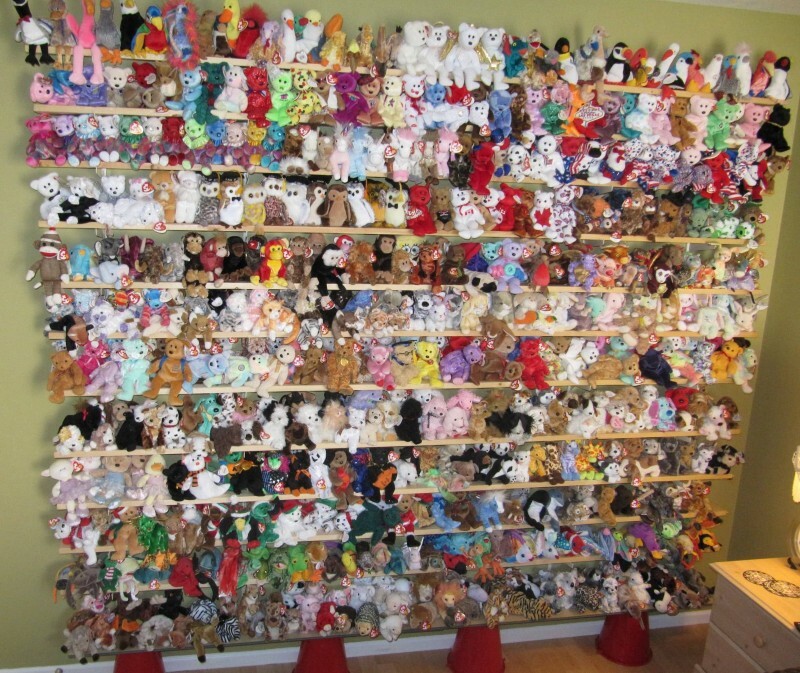 My parents are visiting this weekend, and I need to sell my enormous collection of beanie babies! I’ve approximately 480 little creatures of joy, and I’m selling each one for $20.00. You must buy all 480, though. It is a collection (not an auction)… They are very respectful and amicable with one another, and they are (for the most part) cat and dog friendly. Some are sassier than others, naturally. Please let me know! My parents can’t find out. Amusingly enough, this email isn’t even new to the Internet. It was shared — presumably by one of the many other people on the Georgetown Law listserv — on Imgur, picked up by Reddit, and then featured by Internet humor site Uproxx at the end of July, 2015. 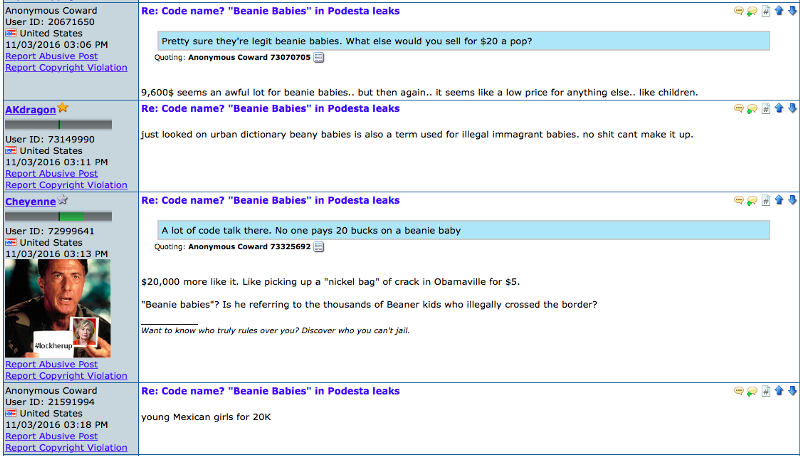 However, that image had itself been posted, in April 2014 (more than a year before the Georgetown email), by a blog titled Perfectly Ridiculous, under the headline #tbt — a nostalgic throwback to the Beanie Baby craze. I’m not sure whether this is the first version of the image, but it’s the earliest I could find through a quick search; at any rate, it shows that the Georgetown email didn’t originate it. In that context, and given the odd description of the Beanie Babies as “cat and dog-friendly” and “sassy” in the original email, we’re pretty much forced to surmise that this was a weird joke shared a bit too widely between coworkers at Georgetown. 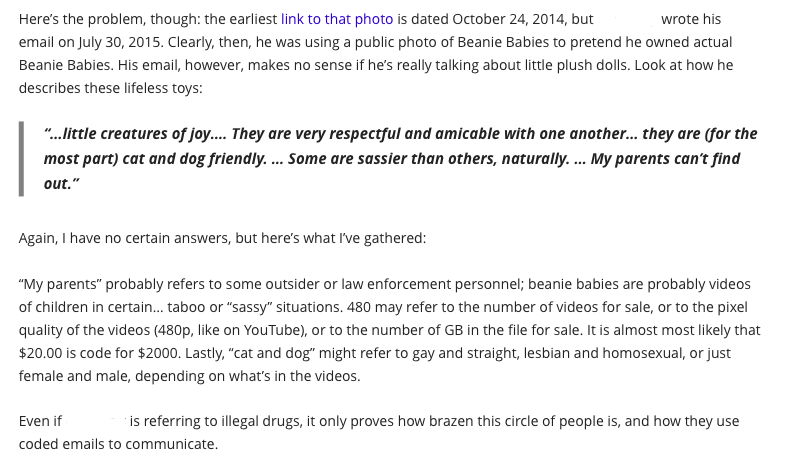 The person posting the email on the Cringe Pics subreddit was essentially doing what the initial sender did — sharing a ridiculous photo of too many beanie babies with a community that will likely have a quick laugh at it and move on with their day. Uproxx picked up the story and showed it to their own viewers for the same reasons, making fun of the initial sender’s ridiculous language as if it were earnest, missing the high probability that the initial sender was joking about it as well. That distantiation increased the chance of laughter, but also decontextualized the image — does the pattern sound familiar?. Luckily, it at least didn’t expose the original sender, redacting the sender address in the email screenshot. 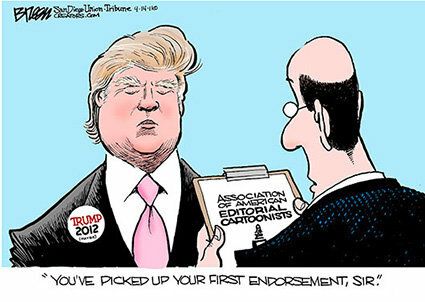 Early in the Trump Era ™, political cartoonists, like latenighthosts, were excited to have Trump for fodder. 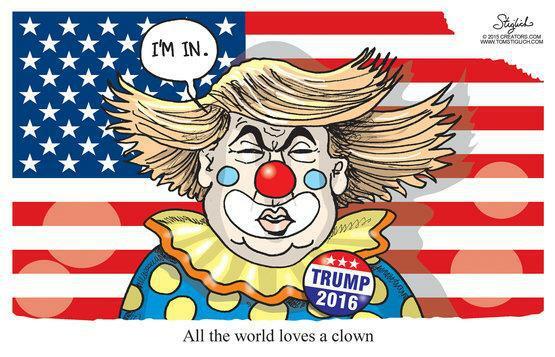 And what is not to love (for a comedian): the hair, the brashness, the class, the near-constant stream of material… it’s the Donald. He was a walking punchline before he entered the race.